Miami Beach’s Nolan Santos struck out 12 in six-and-two-third innings. 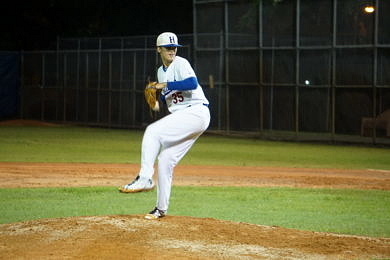 Miami Beach continued their historic season with a 5-3 victory over Hialeah on Wednesday night. The Hi-Tides will now face Columbus in the 9A regional final, with a chance to head to states for the first time since 1974. Two of the best pitchers in the county squared off against each other, as the 9A-14 pitcher of the year, Nolan Santos, went toe-to-toe with the 9A-13 pitcher of the year, Nick Garcia. Santos did not have the start he wanted in the top of the first. He walked Stephen Garcia with one out, and then Kevin Barreneche singled and advanced on a throw to make it second-and-third. 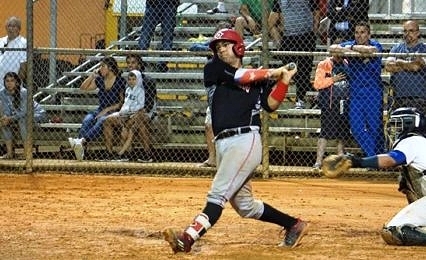 Luis Aquino drove Stephen Garcia home on a sacrifice fly, and Barreneche later scored on a double by Kevin Warrens to give Hialeah an early 2-0 lead. Nick Garcia breezed through the first couple of innings, but got in to some trouble in the top of the third. The Hi-Tides got back-to-back singles from Eduardo Rodriguez and Brandon Perez to start things up. After Ricky Garcia reached on a fielder’s choice to load the bases, Manny Arias hit a sacrifice fly to drive in a run. Nick Garcia threw a solid five-and-a-third innings in his final outing of the year. The Hi-Tides tied things up later in that inning, after Johnny Vasallo got hit by a pitch with the bases loaded. Miami Beach did not stop there. In the top of the fourth, Marcus Garcia shot a double in the gap to lead off the inning. Two batters later, Brandon Perez singled to left to drive Marcus in, to give Beach a 3-2 lead. From that moment on, the game was all Nolan Santos. The T-Breds were retired in order in the fourth, fifth and sixth innings, as the Hi-Tides right-hander was untouchable. Nick Garcia kept his guys in it, pitching a scoreless fourth and fifth inning to hold the deficit at one. Miami Beach added some insurance in the top of the sixth and seventh inning to make it 5-2, but the T-Breds did not go down quietly. 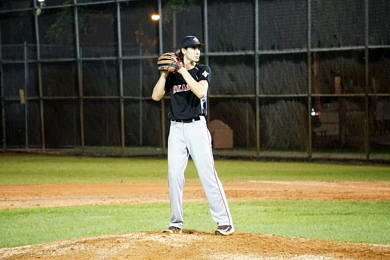 After struggling the past few innings against Santos, Hialeah got a one-out single from Kevin Warrens in the seventh. A couple of batters later, Eduardo Brito drove him in with a single to make it 5-3. Miami Beach got the next three outs and punched their ticket to the regional final. For the T-Breds, this year was a big step forward for the program, as they look to get back to the Hialeah of old, and repeat this success in the years to come.